﻿ The 2014 Florida Sea Turtle Nesting Numbers Are In! The 2014 Florida Sea Turtle Nesting Numbers Are In! Since 1989, the Fish and Wildlife Research Institute (FWRI) has coordinated the Index Nesting Beach Survey, a detailed sea turtle nesting-trend monitoring program conducted in conjunction with the Statewide Nesting Beach Survey. The index survey uses standardized data-collection criteria to measure seasonal nesting and allow accurate comparisons between beaches and between years. Consistent effort by location, date and specialized annual training of beach surveyors make the index program suited to these trend assessments. Approximately 30 percent of Florida’s beach length is surveyed under index-survey criteria. FWRI coordinates data collection through a network of surveyors, including federal, state and local park personnel; other government agency personnel; members of conservation organizations; university researchers; and private citizens. FWRI staff train beach surveyors and compile data from the annual surveys. At a core set of index beaches monitored since 1989, trained surveyors monitor 320 kilometers of nesting beach (nearly 200 miles) divided into zones that average 0.8 kilometers (approximately a half mile) in length. These core index beaches represent the Atlantic and Gulf coasts of peninsular Florida. Beach surveyors monitor core index zones daily during a 109-day sea turtle index-nesting season (May 15 through August 31). Researchers record nests and nesting attempts by species, nest location and date. Index nest counts represent approximately 69 percent of known loggerhead nesting in Florida, 74 percent of known green turtle nesting and 34 percent of known leatherback nesting. Observed loggerhead nest counts on Florida’s 26 core index beaches varied from a peak of 59,918 in 1998 to a low of 28,074 in 2007. In the most recent nesting season (2014), nest counts were slightly higher than in 2013. 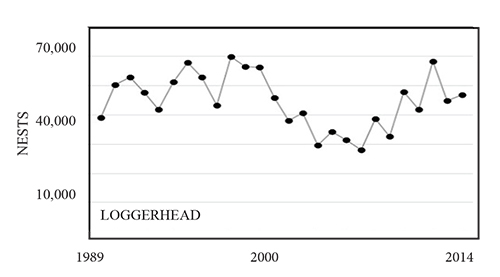 Index beaches in the Florida Panhandle, which are not part of the set of core beaches, had lower loggerhead nest counts in 2014 compared to the previous year. Green turtle nest counts have increased approximately one hundredfold since counts began in 1989 – a trend that differs dramatically from that of the loggerhead. In 2014, green turtle nest counts were much lower than the previous year. Low numbers in 2014 were expected, however, because green turtles set two consecutive record highs in 2011 and 2013. Nesting green turtles tend to follow a two-year cycle with wide year-to-year fluctuations. 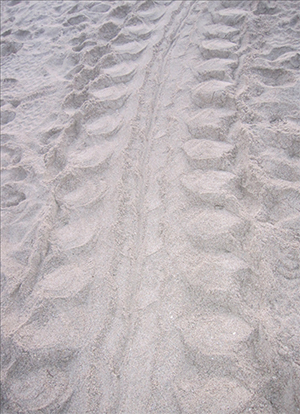 Surveyors counted 641 leatherback nests on core index beaches in 2014 reaching a new record for Florida. 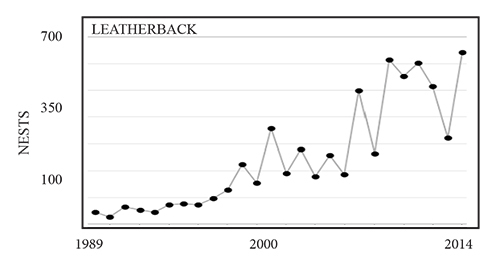 These counts do not include leatherback nesting at the beginning of the season before May 15, nor do they represent all the beaches in Florida where leatherbacks nest; however, the index provided by these counts remains a representative reflection of trends. 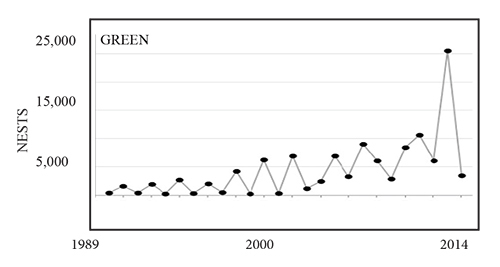 Similar to nest counts for green turtles, leatherback nest counts have been increasing exponentially. 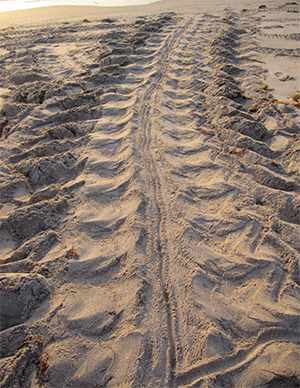 Annual loggerhead nest counts on core index beaches. From 1989 through 2014, annual counts ranged from 28,074 to 59,918 nests. Survey effort remained nearly identical. These data represent peninsular Florida and exclude an additional set of beaches in the Florida Panhandle and southwest coast that were added to the program in 1997. Annual green turtle nest counts on core index beaches. Since 1989, nest counts have ranged from 267 to 25,553, peaking in 2013. Numbers show a mostly biennial pattern of fluctuation, with the 2013 counts exceeding twice the next highest year. 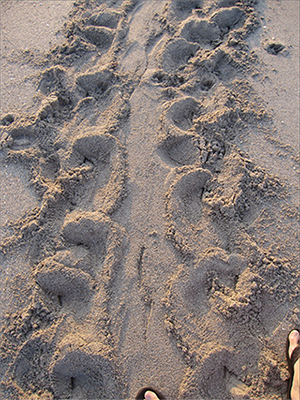 Annual leatherback nest counts on core index beaches. From 1989 through 2014, leatherback nests at core index beaches numbered from 27 to 641, setting a new record high in 2014. 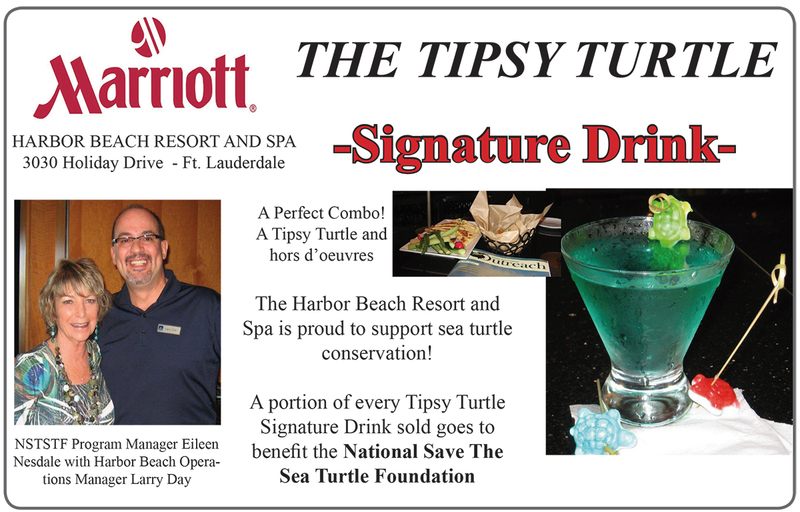 Copyright © National Save The Sea Turtle Foundation, Inc.